A quite important issue that Greece is facing right now, like the rest of Europe, is that every year, big portions of restaurant food are being wasted without having been consumed. The main reason this issue arises is because the leftovers of the customers’ plates cannot be reused by the restaurants. Recent data suggests that about one third of restaurant food is being wasted in Europe, with 1.3 tons of food ending up in the trash, annually. In Greece alone, the estimated average number of food waste is 100 kilograms per person! Given the high levels of poverty and hunger in the past few years, both in a national and international level, there shouldn’t be such enormous portions of food going to waste. That is the reason why the team of Nudge Unit Greece (NUG) decided to run their first nudge experiment to explore this matter. Before explaining the experiment and its results to you, we’ve got to mention the people behind the idea of this pioneering nudge experiment. The title given to this nudge is “The Food-Waste Nudge”. This experiment, in the form of a nudge intervention, was first designed and applied in Italy by Nudge Italia. This time (June 2017) it was adjusted and applied by the team of NUG, in collaboration with the Norwegian Nudging Network and the Oslo and Akershus University College of Applied Sciences university. The experiment took place in Thessaloniki, Greece, in a restaurant near the campus of AUTH university. Thus, the customers of this restaurant were predominantly university students. 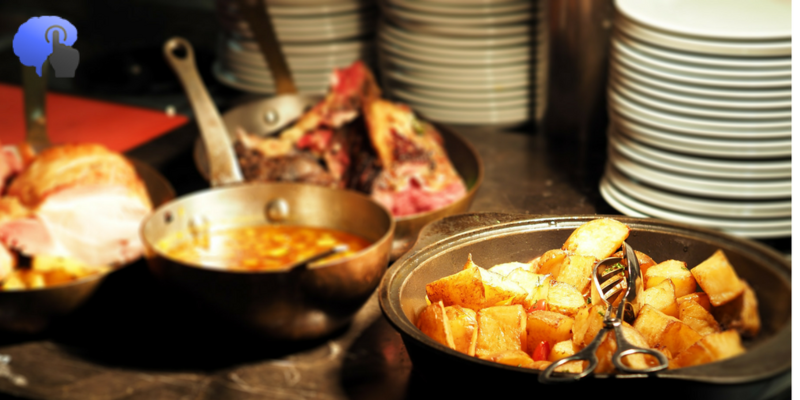 This restaurant was only serving cooked food, and offered food quality and quantity, combined with great prices. The duration of the nudge experiment was 6 weeks, divided in 2 equal phases (Control and Intervention). Before commencing the experiment, we also had to train the personnel on how to gather data and check that they were applying our guidelines properly. The aim of the experiment was to nudge customers to ask for a “foodie bag” in order to take the leftovers with them. We have also pre-decided (with the assistance of the restaurant’s personnel) what amount of food would be considered ‘enough’ for someone to take back home. 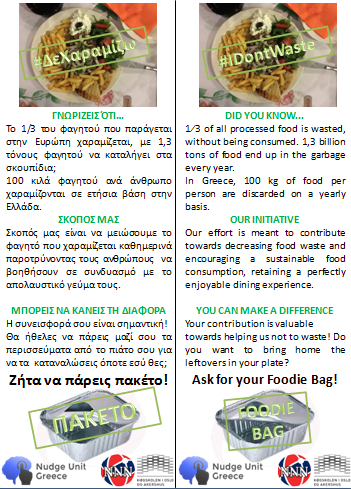 The tool we used to increase the demand for “foodie bags” was a centerpiece (flyer) with information about food waste and a verbal prompt (‘ask for your foodie bag!’), which were placed on all the 24 tables of the restaurant (picture 1). Their shape was a triangural pyramid, so that customers can read the information while seated. 2 sides of the triangle were in Greek, and 1 was in English – in case non-Greek-speaking customers walked in. In the first phase (Control), the personnel collected data about the customers’ behavior regarding the leftovers on their plates, in usual, pre-intervention conditions. In the second phase (Intervention), they collected the same type of data, but with the presence of the nudge. In that way, we could compare the results in the same periods of time. By taking the leftovers with them, customers could take advantage of eating another time back home – which they’ve already paid for, anyway! With our tool, they realised that they do something beneficial to themselves and the environment at the same time. The flyers had a double purpose: on the one hand, they were used to grab the customers’ attention and raise awareness about the food waste issue and its consequences. On the other hand, they informed them about the availability of foodie bags, and that it’s something common for someone to ask for one in such a place (social proof). In the design of the flyers, we ensured that they triggered the customers’ emotions and their sense of responsibility about the issue. Hence, we addressed the customer directly, and we also included the simple call-to-action phrase “Ask for your foodie bag!”, in the end. What had also contributed in the effectiveness of the nudge, was a simple prompt by the waiters, when the customers were about to pay the bill: “Would you like to take a foodie bag for your leftovers?”. After the first data results, we figured out that a lot of customers, such as university students, aged 18-24, tend to take their leftovers with them, with or without a nudge. Because of that, the results before and after the introduction of the nudge were statistically insignificant. There’s a high probability that the short length of the experiment affected the results. However, the ‘Food-Waste Nudge’ had a positive effect. Speaking in numbers, there was an overall 10.38% increase in the demand for foodie bags from the customers that had leftovers on their plates. The team of Nudge Unit Greece, in collaboration with the Norwegian Nudge Network and Nudge Italia, conclude that, in order to present more accurate results and findings about the effectiveness of this nudge, we need to test it in different kinds of restaurants (different categories of customers) and in different regions, as well. Thus, the next steps for the NUG team is to collaborate with other restaurants around Greece, in order to find the best possible solution to the issue of produced food waste. Stay tuned for more information and additional results! *The same experiment was first tested in Milano, Italy, in a pizzeria, which included one more phase in the experiment (Default Treatment) and the results were quite impressive! The details of the process and the results of the Food Waste Nudge across Europe will be presented by its creators in November 14-15, 2017 at the Ninth International Conference in Paris, France. **We would like to mention that we had an excellent collaboration with the owner of the restaurant and the personnel, and we thank them very much! The name of the restaurant isn’t mentioned in this post, after the kind request of the owner.